One of my favorite foods is anything fried: fried chicken, fried zucchini, fish and chips, fried won tons, and on and on. So, of course, I was very happy to find out that Indian street food included a delicious snack called pakora. Pakora is basically just about anything dipped in batter and fried — most commonly bread, paneer, and vegetables such as potatoes, cauliflower, or bell pepper. The pakora-walla ("pakora person") cooks up his tasty goods in bulk, then sets them out on newspaper to be sold. When it's time to be dished up, often the pakora or other fried foods are put back into hot oil to be reheated. Then again, sometimes they're not. On the train to and from Shimla, we often hopped off when the train stopped to buy the fried goods that were on sale. At one stop, twenty rupees (about forty cents) got us two samosas with a generous squeeze of Indian ketchup. (One samosa at my local farmers' market is three dollars, so this was an exciting purchase for me!) 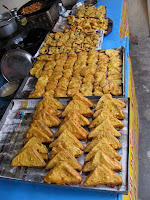 Elsewhere, we had bread pakora — just plain white bread, battered and fried. At the Amber Fort outside of Jaipur in Rajasthan, we had the best samosas I'd ever eaten. The food at the stall had been sitting out for who knows when, the flies were abuzz, and the samoses weren't reheated. But the crust was crisp and buttery, and the potato filling was nicely spiced. I was so glad we had eaten there, even though I joked that I was risking traveler's sickness for a pocket of tasty fried goodness. Another fried food I discovered was at an expansive market in Delhi called Dilli Haat, which included goods and foods from every state in India. Lunch included momos, little deep fried dumplings filled with chicken. They were served with a bowl of steaming broth, which was quite bland but felt warm in the tummy. As recommended by the Anthropologist's friend, our guide through Dilli Haat, we made a mix of hot sauce and vinegar to dip our momos in. The wrapper crunched as I bit into it, and the sauce packed a much needed punch to the delicious but not particularly remarkable filling. A word about street food and food in general in India: It's important to be careful when you're traveling abroad and eating food cooked in a stall or on the street. But don't let the fear of getting sick prevent you from having an amazing culinary experience. The truth is you are going to get sick. No matter how careful you are. I was fairly cautious, didn't drink the tap water (or use it to brush my teeth), avoided eating meat from street stalls — and I got mildly sick anyway. When you're in a country that's very different from yours, it's hard to avoid stomach bugs that your system isn't used to — unless you're determined to not eat anything that isn't from a three-star or above restaurant. Which would be too bad because you really would be missing out on a lot of new and wonderful foods.